Jump into the Nightmare Before Christmas movie with this Jack Skellington costume. The ensemble includes jacket, mask, ascot and bow tie. 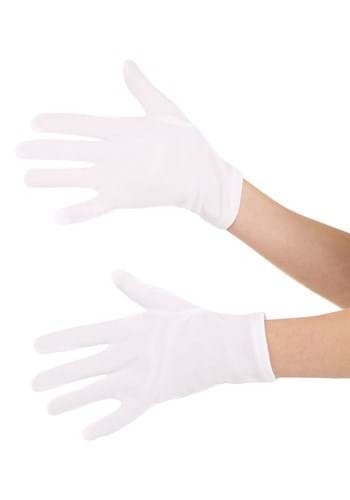 Wear them with your own black pants and add a pair of white gloves to become the debonair mayor of Halloween Town. Pair this look with our Sally costume for a great couples look. Bring the Nightmare Before Christmas to life in this Adult Sally Costume! Help Jack learn what Christmas is about and save Santa from the Oogie Boogie. 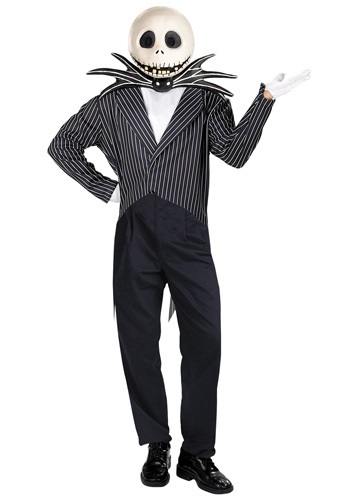 We also carry the Jack Skellington costume from the Nightmare Before Christmas movie--get it for your date! 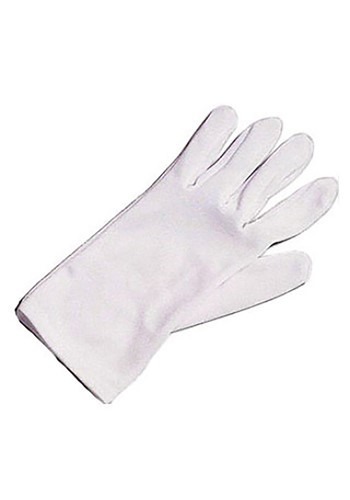 Serve the empire in style with a pair of Adult White Costume Gloves. They are an affordable way to follow your Dark Leader's commands. When you see the pinstripes then you know you're in the presence of a true Pumpkin Queen. This year, she is declaring that she's having Halloween on Christmas. She's quite the unique queen, and stylish too! We love the Nightmare Before Christmas around here. It's one of our favorite movies, and a must watch every year. Maybe that's kind of obvious, because we're Halloweencostumes.com, after all, and Halloween is in our name! Honestly, it almost feels like we actually live in Halloweentown around here. So, when this t-shirt came in we all got excited. And then the discussions started about Jack's bowtie... is that thing really alive? If so, does he have to feed it? Does it ever fly away? Should we call it a bat-tie? If it IS alive then that seems like the most annoying bowtie in history! But maybe it also knows some adorable tricks, or something. If you're getting this Jack Skellington costume tee, there's no need to worry, the bowtie and all the other elements are just printed! Now all you need is to work on your best Danny Elfman impression for your solo in, "Jack's Lament." Forget the Jedi let your young one know it's okay to be a Stormtrooper. Support his love for the dark lords followers, buy a pair of Kids White Costume Gloves. 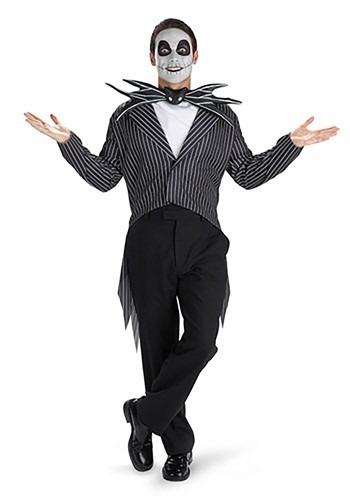 Become a memorable Tim Burton character with this licensed Jack Skellington costume for men! It includes a jacket, bow tie and ascot; wear them with your own black pants, or buy ours. Leave that no-account Oogie Boogie out of your Halloween! Have you been spending your free time looking for the portal to Halloween Town? It's a lot harder to find it than it sounds. If you really want to hang out with Jack Skellington, you can always just make him come to you. After what happened in The Nightmare Before Christmas, it's pretty clear that Jack has got the hots for Sally, so all you need to do is convince the Pumpkin King of Halloween Town that you're her. This dress is really all it takes for that. 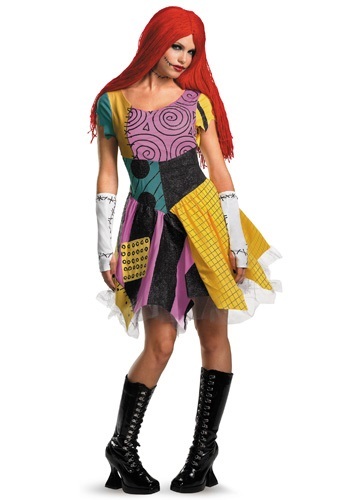 You’ll look like Jack’s girlfriend in this plus size Sally costume! It's a jagged-edged, short-sleeved shift dress of 100% polyester interlock knit that fastens at the back of the mock-turtle neck with Velcro. The front and sleeves are patchwork print, the back is solid pink; it has self-fabric waist ties for fit adjustment. The elbow-length fingerless gloves are pale blue poly interlock with printed black stitching. The wig is red 65% polyester/35% acrylic yarn on a poly mesh cap with elastic in the edge. Add this costume to your Nightmare Before Christmas group this Halloween! It's never too early for your tot to get started on the Nightmare Before Christmas. And what better way for him to be prancing about than as Jack Skellington. This costume features the signature trademarks of the character with a soft skull cap and bat logo attached to the front. Let him be the star of your party whether it's Halloween, Christmas, or any other holiday for that matter. As you can imagine, The Nightmare Before Christmas is pretty popular around here at Halloweencostumes.com. You might say that the subject matter is right up our alley. Everyone loves Jack, of course, but Sally is definitely an underrated character. She has one of the sweetest, loveliest songs in the whole movie! And her ability to concoct clever knock out juice just shows she's got brains as well as talent! Bring a little piece of Halloweentown home with you with our infant Sally Costume! Don't worry, it's all stitched together. You'll be the object of Jack Skellington's desire once you slip into this Sally Glam Costume! To him you're gorgeous, to the rest of us you're the The Nightmare Before Christmas! Having trouble getting a date with Jack Skellington? We've got a look from A Nightmare Before Christmas that will knock his socks off. He does wear socks, right? Slip into this officially licensed Sally Glam Plus Size Costume and he'll be giving you a call real soon! Jack won't be able to resist you in this sassy Sally costume! 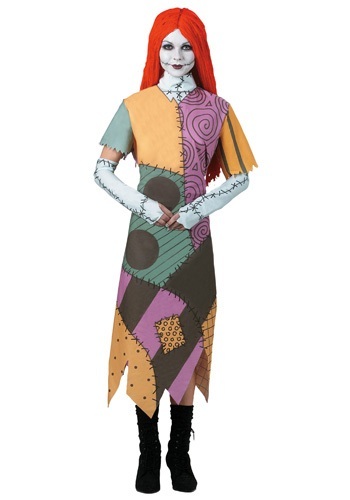 The licensed Nightmare Before Christmas costume includes a polyester dress that velcros in the back for closure. 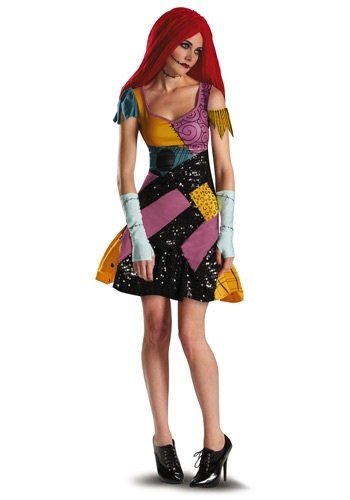 The patchwork dress features a variety of designs and colors including shimmering black. The short sleeves and bottom have a jagged hemline and a white petticoat slips on under the skirt for more volume. The petticoat has an elastic waistband, as does the back of the dress, and is lined with grey mesh along the bottom which peeks out of the dress. The red, yarn wig is lined with elastic for a snug fit and a pair of light grey glovelettes with shimmering black accents is also included. 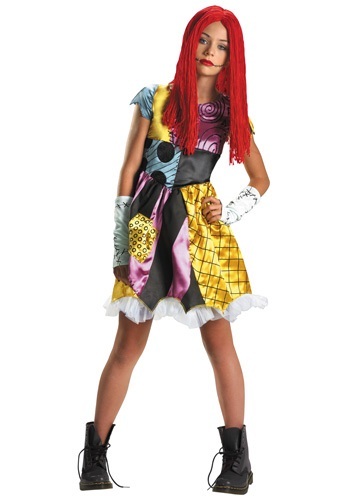 Let Jack know how much you love him in this sassy Sally costume! Fill that empty place in your bones with this Teen Jack Skellington Costume! It includes a jacket, bow tie and ascot; wear them with your own black pants. You'll love being a part of the Tim Burton classic this Halloween! Grab a little Worm's Wort and Nightshade and head out on the Halloweentown in this Teen Sally Costume. Pair up with our Jack Skellington costume and you'll have one "Nightmare" of a Halloween (but in a good way!). 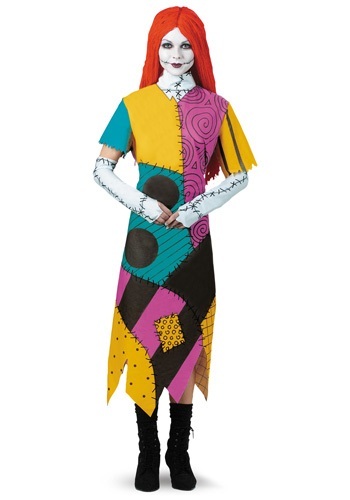 Dress up like Sally from The Nightmare Before Christmas in this colorful and unique Tween Sally Costume! The ensemble includes short-sleeved dress, petticoat, wig, and fingerless gloves. You'll be ready for Halloween or Christmas when you wear this cute costume!